Rosebud Farm Touring Park - local attractions to visit nearby whilst staying in North Cornwall. North Cornwall has some of the best attractions that Cornwall has to offer from the unspoilt fishing villages and harbours to the Camel Trail and long sandy beaches, all within easy reach of Rosebud Farm Touring Park. 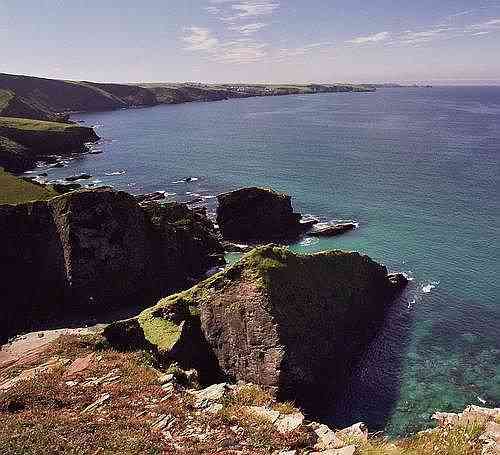 Trebarwith Strand is approx 2 miles from Rosebud, and can be reached on foot along the coast path or road. Trebarwith is a superb all round beach that boasts good bathing and surfing with plenty of nooks and crannies for the marine explorers amongst you. At low tide Trebarwith Strand is almost a half mile long stretch of unbroken golden sand. This beach is dog friendly, has good general facilities, ample parking and easy access. This small picturesque and historic fishing village and home to the TV series Doc Martin, is set amidst magnificent scenary. Padstow is a charming working fishing port surrounded by glorious sandy beaches, at the head of the Camel Estuary. The wow factor doesn`t even begin to cover it - Legend has it the granite rocks dotted across the beach were stepping stones for the Giant Bedruthan. You can see why these views were used by the team creating Poldark for some of the scenes featuring Ross galloping on horseback. Tintagel Castle stands on the wild and rugged north coast of Cornwall, suffering much erosion over the centuries. The site is split into two distinct segments: the landward section containing the remains of the upper and lower wards that stand rather precariously on the edge of a crumbling precipice; and the inner ward that lies on the narrow ridge linking the island to the mainland. It is not known for certain who built the medieval castle but evidence suggests it was Richard, Earl of Cornwall (brother to Henry III), as he acquired the site c1234, which seems to coincide with the date of the current remains. Perfect setting for romantic meal or special occasions. Nestling among the modern buildings of Tintagel high street, this unusual and atmospheric 14th centuary Yeoman`s farmhouse, with a famously wavy roof. The house, and its surrounding cottage garden, are in the ownership of the National Trust and the building is Grade 1 Listed. Experience a spectacular 60' waterfall through a hole in the rocks. Accompanied by 2 additional waterfalls and a beautiful woodland walk by the river. This idyllic setting was devastated by the flash flood in 2004, when torrential rain created a 14' wall of water which swept away cars and buildings. Cardinham woods is a beautiful dog-friendly mixed woodland popular with walkers and cyclists, it boasts a difficult off road bicycle trial and award winning cafe. Launceston Castle has countryside views from its round tower with interesting history & exibition. The Eden site is bigger than it looks. There’s a lot of walking if you want to see it all so please bear in mind that a rewarding visit can also be a tiring one. A land train runs between the main site and Visitor Centre to save you the steepest climb, but you will still face some slopes within the Biodomes. Manual wheelchairs are available on a first come first served basis. A very popular and safe beach break for all ages and ability. Works well at low tide and on the push in. At low tide the right hand side gets very crowded due to the sand bank that produces a great inside section. Very popular beach especially with windsurfers, in general, this is the last place to look for waves, however, on the biggest storm swells this is probably the only place you will be able to surf, when Polzeath is excessively big and blown out. Delabole's secret beach on Cornwall's Atlantic Coast, good surf, golden sands, no shops, and high cliffs. Tregardock, Delabole's long guarded secret beach. Delabolians have been protective of our beach for generations. If you get to know a local well enough they might let you into the secret. Pick a nice day and take a bike ride along the famous Camal Trail, with breath-taking scenery over the Camel estuary. The trail can be broken into small rides from Wadebridge to Padstow 5.5 miles, Wadebridge to Bodmin 5.7 miles and Bodmin to Wenford bridge 6.25 miles. This multi-use trail is for cycling or walking along a virtually level disused railway track with cycle hire and refreshments at several points along the 17.5 mile route. An all weather attraction is the historic former prison situated on the edge of Bodmin Moor, can also be accessed via the Camel Trail. At approx 500 foot deep, and 1.5 miles circumference, this is a spectacular walk around this 17th century Quarry. 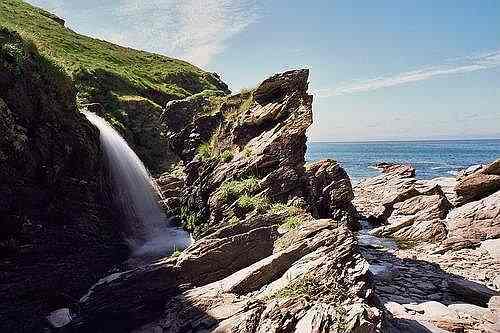 We would like to recommend iwalknorthcornwall who have some fantastic walks listed with maps & great info of the North cornwall coast path, There are public footpaths linking the coast road to the North Cornwall coastal path local to the site (approx 1/2 mile) below are some of the views seen from these walks. Dominating the skyline to the southeast of Delabole is Roughtor, the second highest tor on Bodmin Moor. From the top on a clear day, the north and the south coast of Cornwall can be seen. This can be achieved by a half an hours walk from the car park at the bottom, which can be accessed by a long narrow road from Tregoodwell near Camelford. Bronze Age remains abound on the moor, and a mile away to the south is Brown Willy, the highest tor in Cornwall. At the summit of Roughtor is a memorial to the men of the Wessex Division, who fell in the second world war. At the foot of Roughtor by the stream, will be found the memorial to Charlotte Dymond, the victim of a Victorian Murder. Recently voted "The Nation's Favourite Garden" by BBC Gardeners' World viewers, the award-winning restoration of Heligan's productive gardens is only one of many features which combine to create a destination with a breadth of interest around the year. In excess of 200 acres are open to the public, including a magnificent complex of walled gardens, and 22 acres of subtropical 'jungle' valley. Click here (or click the picture below) to see the many beautiful National Trust locations around us, you'll be pleasantly suprised by just how many are within easy driving distance of our site.